The Inland-Skinner Sights are hand crafted in St. Ignatius, Montana. Machined from solid steel, bar stock, the parts are hand fitted to close tolerances. The Inland-Skinner M1 sight is extremely functional and rugged, and complements the M1 Carbine. The sights are simple and fast to use. Elevation is adjusted by loosening the thumb screw and turning the aperture stem in and out. Each full turn measures .025" (.0125 half turn) which is approx 2 MOA. The sight provides a total of .150" elevation that exceeds the USGI Adjustable sight by .030", giving the shooter adjustments beyond 300 yards. The windage is adjusted by using a 1/16" allen wrench to loosen the locking cap screw and simply drift the sight left or right. 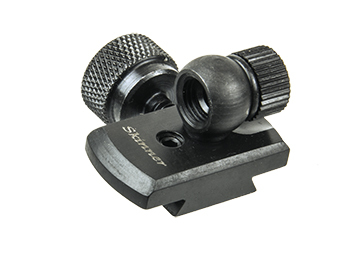 The standard aperture for the Inland-Skinner M1 sight is .096 diameter, smaller target apertures are available as well as B. Jones (TM) target lens apertures that are popular with competitive high power shooters. The Inland-Skinner M1 sights are guaranteed with a 30 day, money back, policy. Your satisfaction is very important to us. If at any time your sight needs to be repaired, we will do so at no charge. Discharging firearms in poorly ventilated areas, cleaning firearms or handling ammunition may result in exposure to lead, reproductive harm and other serious physical injury. - Have adequate ventilation at all times. - Wash hands thoroughly after exposure.